Republican Gov. Larry Hogan’s office joined senators in presenting three identical bills at a Senate committee hearing Tuesday to repeal the “rain tax,” the pejorative nickname for stormwater remediation fee. “Repealing this tax mandate is a top priority for the governor, it is a top priority for him because it is a top priority for the vast majority of Maryland,” said Patrick Hogan, deputy legislative officer of the governor’s office, about the proposed SB 588. However, the Senate Education, Health and Environmental Affairs committee still has one more rain tax proposal to consider. 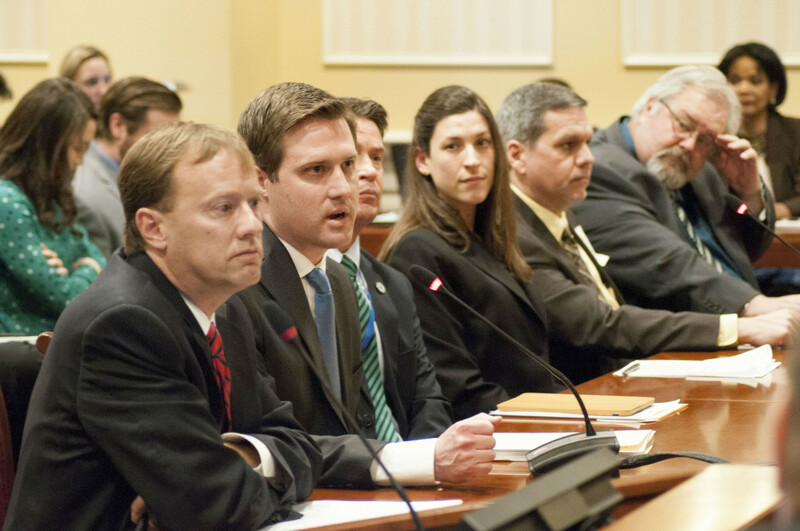 Senate President Mike Miller will present his own stormwater bill to the committee next week. That proposal, which has 30 Senate co-sponsors, including 11 Republicans, would lift the requirement on the counties to charge the fee and make it optional. It would require more reporting from the counties, however, on how they will pay for required stormwater remediation and water quality improvement projects. Environmental groups remain opposed to the repeal of the mandated tax to meet federal pollution rules. While legislators are saying it will help small business growth, Chesapeake Bay advocates are saying the repeal will send Maryland’s environmental efforts into a backslide. A state law passed in 2012 requires counties and municipalities to charge the fee. Currently, nine counties and Baltimore City are affected by the mandate, however it is left to the counties’ individual discretion on the amount to charge. The governor hopes the repeal will allow counties flexibility. Harford County Executive Barry Glassman, a Republican, was able to repeal the fee within the first 60 days of the 2012 mandate. Glassman found an existing fifty-five cents that was being put into the water and sewer enterprise fund and used that for stormwater restoration goals instead. Sen. Jim Brochin, a Baltimore County Democrat and sponsor of SB 36, which is identical to the governor’s bill, believes the mandate was slapped onto businesses who did not have time to factor in the added expense. Jessica Cooper, state director of the National Federation for Independent Business (NFIB), said the small businesses she represents are struggling with the tax and are reporting a 17% increase in their taxes. While small business may be struggling to afford the tax, environmental consulting businesses will struggle if the tax is repealed. Scott Macomber, president of the Maryland Stream Restoration Association, believes the association’s growth has only been stable since the creation of the stormwater tax. “We are adding jobs to the Maryland economy because of the stormwater fee,” Macomber said. Those jobs include concrete plants, independent truckers, surveyors, landscapers and geotechnical engineers. His concern is that these jobs will be lost while local jurisdictions are looking for funds to replace the repealed tax. “The current momentum that our industry has gained will be lost and the industry will will backslide,” said Macomber. Jim Gracie, president of Brightwater Inc., said it’s hard to make the investment to hire and train someone at a small firm as funding fluctuates wildly. “We need a level, predictable source of funding in order to grow, and grow we must,” Gracie said. Gracie told legislators the amount of work that has to be done for mandated stormwater remediation is about four times the capacity the industry currently has. If the governor’s bill were to pass, counties could still establish a tax to meet their federally mandated goals. Whatever counties choose, the governor’s office will make sure “they are doing the things necessary to meet these goals,” said Patrick Hogan.